Vape shop on North End. It opened in May 2017. 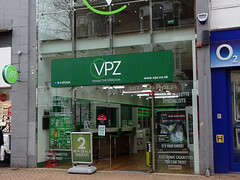 It was previously known as Vaporized photo, but rebranded to VPZ some time between July 2018 and February 2019. It was previously a branch of Pret A Manger photo, but this closed down some time between August 2014 and March 2015 photo. In April 2015, a cafe and sandwich shop called Pita Pit photo opened, specialising in meals served in pita bread, but this closed down again in April 2016 photo of signs in window. Around November/December 2016, a gift shop called Petals opened photo. This had previously been located at Unit 3 in Centrale. However, it closed down again in either January or February 2017 photo. It was still vacant as of April 2017, but there seemed to be building work going on inside. A vape shop called Vaporized opened in May 2017. Last edited 2019-03-08 15:21:29 (version 60; diff). List all versions. Page last edited 2019-03-08 15:21:29 (version 60).